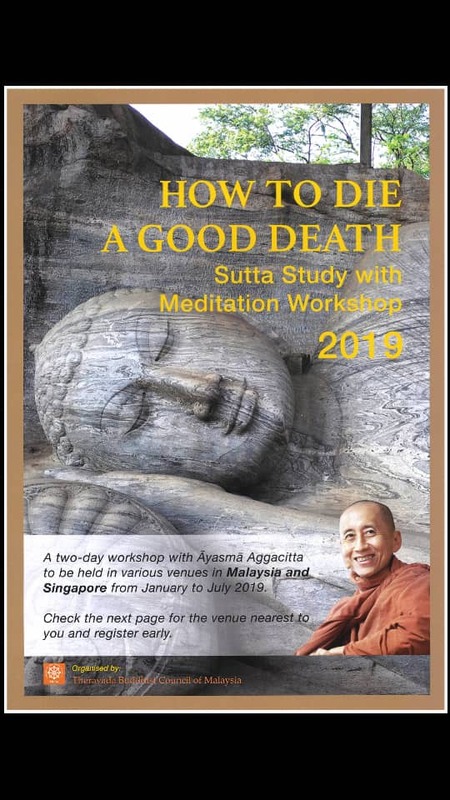 1) A 10-day Vipassana Meditation Retreat is being held in SBJA until this Saturday, 12 January 2019. The Retreat will be conducted by Sayadaw U Sobhita. Sayadaw U Sobhita is a highly respected meditation teacher at the renowned Chanmyay Meditation Centre, Yangon, Myanmar, assisted by Sayadaw U Pinnyarnanda, the Abbot of Chanmyay Yeiktha Meditation Centre, Pyin Oo Lwin branch, Myanmar. Please try to maintain a quiet and conducive environment in the vicinity of SJBA Vihara for the meditators. If you wish to sponsor food for expenses during the Retreat, please contact our Sis. Lily 03-56348181, 03-56315299 for more information. 2) SJBA invite you and family and friends to a spiritual and mentally enriching morning at this Sunday’s Buddha Puja commencing at 9.15am with offering of lights, flowers and incense to the Buddha, chanting and Dhamma Talk by Bro. Tan Siang Chye. 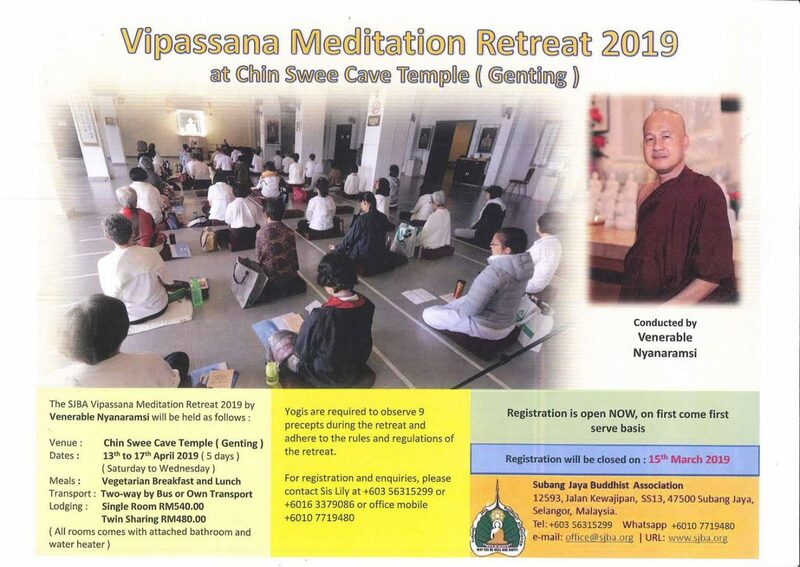 1) A 10-day Vipassana Meditation Retreat is being held in SBJA until 12 January 2019. The Retreat will be conducted by Sayadaw U Sobhita. Sayadaw U Sobhita is a highly respected meditation teacher at the renowned Chanmyay Meditation Centre, Yangon, Myanmar, assisted by Sayadaw U Pinnyarnanda, the Abbot of Chanmyay Yeiktha Meditation Centre, Pyin Oo Lwin branch, Myanmar. Please try to maintain a quiet and conducive environment in the vicinity of SJBA Vihara for the meditators. If you wish to sponsor food for the monks and other expenses during the Retreat, please contact our Sis. Lily 03-56348181, 03-56315299 for more information. 2) SJBA invite you and family and friends to a spiritual and mentally enriching morning at this Sunday’s Buddha Puja commencing at 9.15am with offering of lights, flowers and incense to the Buddha, chanting, Dhamma Talk, Blessings and Sharing of Merits. 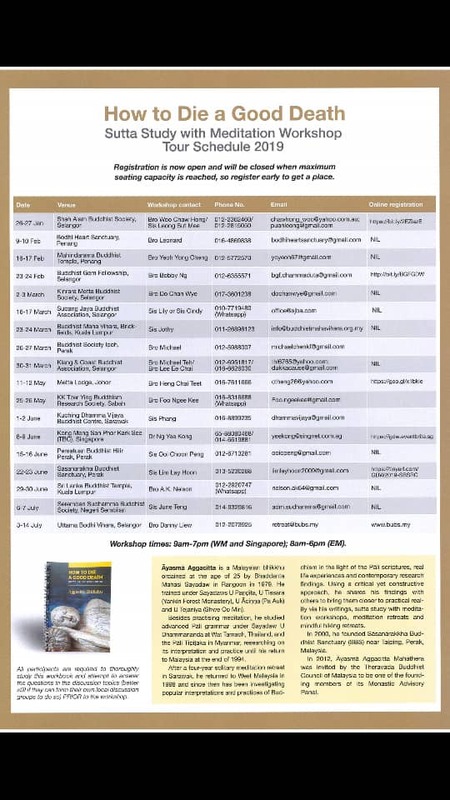 The Workshop in SJBA is on 16, 17 March 2019. Limited to 120 participants only. Please register with Sis. Lily or Sis. Cindy in SJBA Office. Registration will close upon reaching 120 participants. 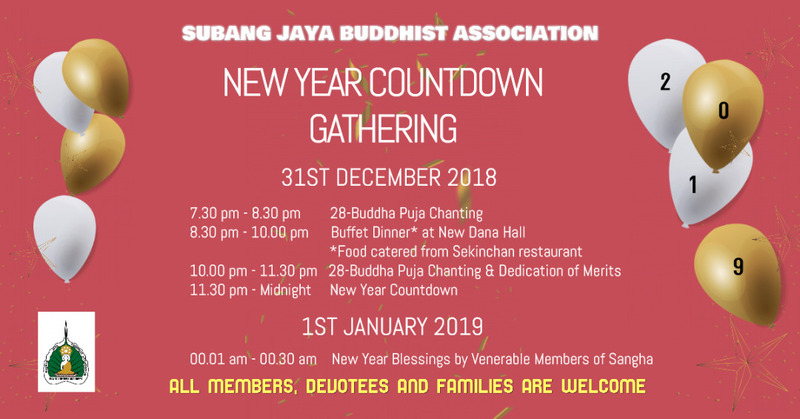 1) SJBA is organising the auspicious 28 Buddhas Puja beginning with an Inauguration Puja on 15 December 2018. From 16 December to 31 December 2018, there will be daily chanting during the weekdays’ morning from 8.00am to 11.00am and in the evening from 7.30pm to 10.00pm. On Sundays, morning chanting will be from 8.00am to 9.30am and evening chanting from 7.30pm to 10.00pm. 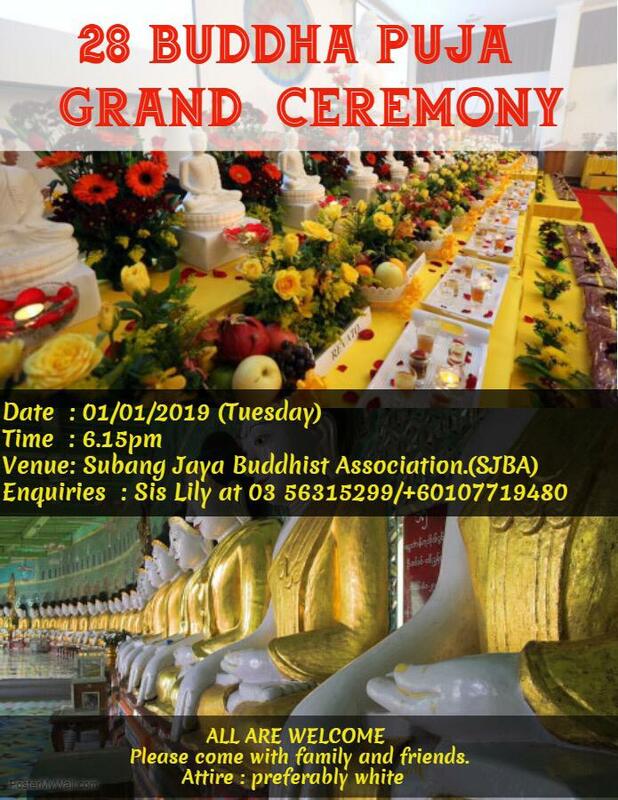 The finale, a Grand 28 Buddhas Puja Ceremony will be held on Tuesday, 1 January 2019, 6.15pm to 10.00pm. You can help by sponsoring any amount. You can also be one of the main sponsors (RM1,000). Please contact Sis. Lily at 03-56348181, 56315299. You may also bank transfer to SJBA Account CIMB 8003294666 and whatsapp the bank-in slip to 0107719480. 3) SJBA is organizing a 10-day Vipassana Meditation Retreat from 3 to 12 January 2019. The Retreat will be conducted by Sayadaw U Sobhita. Sayadaw U Sobhita is a highly respected meditation teacher at the renowned Chanmyay Meditation Centre, Yangon, Myanmar. He was born in 1951 and was fully ordained as a Bhikkhu by the Most Venerable Sayadawgyi U Janakabhivamsa in 1970. He studied the Dhamma under Sayadaw U Tejavanta, Sayadawgyi U Janakabhivamsa and other famous Sayadaws in Myanmar. In 1983, he practised Vipassana Meditation under the guidance of the late Mahasi Sayadaw. Since then, he has been teaching the Dhamma, especially meditation, to devotees in Myanmar and abroad. If you wish to sponsor food for the monks and yogis, and other expenses during the Retreat, please contact our Office Administrator for more information. 4) SJBA invite you and family and friends to a spiritual and mentally enriching morning at this Sunday’s Buddha Puja commencing at 9.15am with offering of lights, flowers and incense to the Buddha, chanting, Dhamma Talk, Blessings and Sharing of Merits.